While humans are alone in their struggle to balance work and Netflix, all creatures wrestle with proper timing. With limited resources, organisms are pressed to use time wisely in all aspects of their lives. As University of Washington researchers recently discovered, this struggle even extends to something as sweet and pleasant as the fragrant scent of a garden flower. A team of UW biologists has identified a key mechanism plants use to decide when to release their floral scents to attract pollinators. Their findings, published online June 29 by the Proceedings of the National Academy of Sciences, connect the production and release of these fragrant chemicals to the innate circadian rhythms that pulse through all life on Earth. The researchers studied these questions in the common garden petunia. This white-flowered hybrid releases an aromatic, sweet-smelling fragrance in the evening to attract insect pollinators, such as hawk moths. Biologists have long recognized that creatures like plants, humans and even tiny bacteria all have circadian clocks – genes that keep their cells synchronized to the 24-hour cycle of life on Earth. These genes regulate cellular activities based on the time of day. Researchers had previously shown that LHY is a component of the circadian clock in other flowering plants, but this week’s paper marks the first time biologists have connected LHY activity to flower scent. “Now we’re finding out what the bridge is between the circadian clock and scent production and release,” said Myles Fenske, a UW doctoral student in biology and one of three lead authors on the paper. 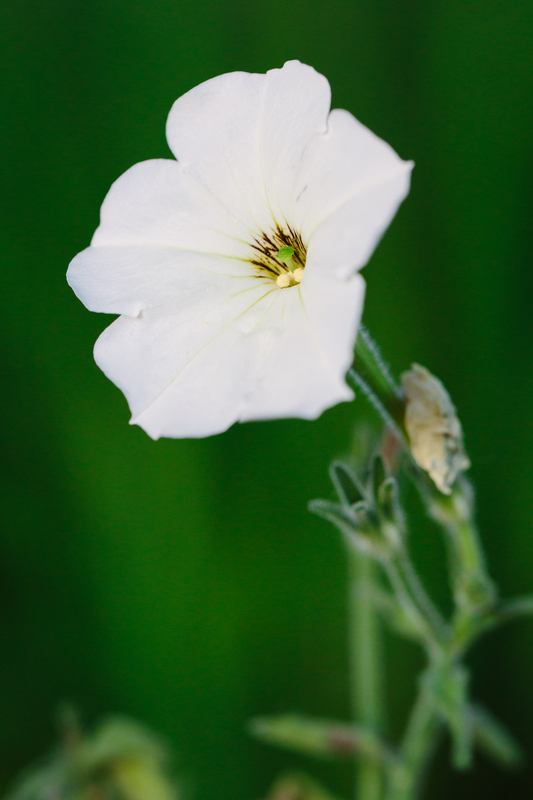 Since no one had ever studied the LHY gene in petunias, Fenske and his fellow researchers gathered basic information about LHY to show that it has the same circadian functions as it does in other plant species. Many circadian clock genes are only active at specific times of the day, when they influence the activity of other genes that control what cells are doing. The researchers in Imaizumi’s lab discovered that the petunia LHY gene is most active in the morning, at the opposite time of day when the petunia releases its fragrant evening scent. Imaizumi and his team hypothesized that LHY’s morning activity might repress the production of scented chemicals. When they prolonged LHY’s activity into the evening, the petunias didn’t release their fragrant chemicals at all. If LHY’s activity truly did have a negative effect on scent production, then petunia plants that lacked the LHY gene’s burst of morning activity might produce and release their scents earlier in the day. Fenske and his colleagues created petunia plants with reduced LHY activity. Those plants produced and released fragrant chemicals four to eight hours earlier in the day. Imaizumi’s team even discovered how LHY represses floral scent production. It interferes with the activity of ODO1, another petunia gene that promotes the production and release of floral scents. By repressing ODO1 activity early in the day, LHY stops the floral scent assembly line in its tracks. When the LHY gene becomes less active later in the day, ODO1 is able to ramp up production of the fragrant chemicals just in time for the evening aromatic release. Since genes like LHY and ODO1 are present in most – if not all – flowering plants, Imaizumi and his team believe that the interactions between these two genes may be a common mechanism for a plant’s circadian clock to influence or control the production of fragrant floral scents. If so, then changes to the strength or timing of the LHY-ODO1 bridge may explain how flowers change the timing of scent production as they evolve. Imaizumi and his team are now testing if pollinators have a preference between normal garden petunias or petunias with altered LHY activity. In time, these experiments may pave the way for scientists to improve the pollination efficiency of other plants, including important crop species. “We think you can really change a plant’s success by changing these cues,” said Imaizumi. The entire team was made up of researchers from the UW biology department. Fenske’s fellow lead authors were technician Kristen Hewett Hazelton and undergraduate Andrew Hempton. Other authors included postdoctoral researcher Jae Sung Shim, undergraduate Breanne Yamamoto and assistant professor of biology Jeffrey Riffell. This research was funded by the National Institutes of Health (GM079712 and T32GM007270) and the National Science Foundation (IOS-1354159).